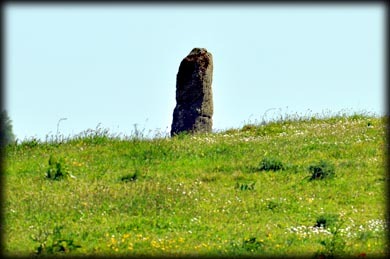 This two metre tall conglomerate standing stone was only recently discovered in May 2013. It may have been hidden in undergrowth for years. The long axis of this 0.6 metre wide stone is oriented NE/SW. 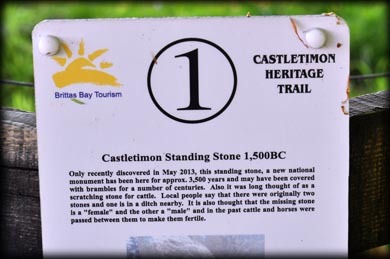 The stone is now part of the Castletimon Heritage Trail. The information sign, pictured below, tells us that locals believe there were originally two stones, a male and female pairing; the second stone is thought to lie in a ditch nearby. Lying in a niche by the side of the road, about 250 metres west of here, is the Castletimon ogham stone. It is said that horses and cattle were passed between the pair of stones to make them fertile. There are similar traditions associated with other stone pairs located around Ireland. Situated: From Brittas Bay head north on the R750 for about 1.5 kilometre then take a left at Potters Point onto the L5108. The stone is 1.8 kilometres down here on your right in the field in front of Castletimon House. Discovery Map 62: T 3004 8547. Last visit June 2016.